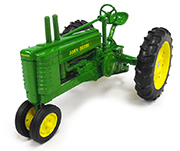 Ertl's Big Farm 1:16 scale vehicles are the only line of off-road toys designed with loads of detail that features lights and sounds play action. Ertl Big Farm is a great alternative for younger children and kids can enjoy hours of indoor and outdoor vehicle play with this line of durable tractors and equipment. Size in inches: 16.5" x 6" x 6"